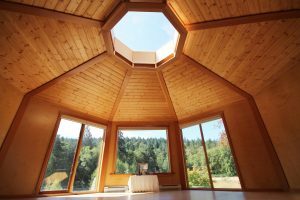 We invite you to hold your next workshop, program, retreat or other event at the Salt Spring Centre of Yoga. Our serene setting and inviting, supportive atmosphere make it a great location for your group gathering. The Centre offers a variety of facilities for day or overnight group rentals. We are able to provide vegetarian meals and cozy accommodations. Yoga props including mats, foam blocks, blankets, belts, bolsters, and eye pillows are available to use during your stay and are included in facility rental fees. Taxes will be added to all fees. 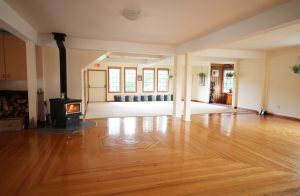 The Centre’s main heritage house features hardwood floors, stained glass windows and a wood burning stove. Available for groups booking the main program house who need an additional session space. Planning a one‐day event and would like to have a meal? Enjoy a farm fresh and tasty vegetarian meal for which the Centre is renowned. Add lunch or dinner to your full day rental for $24 per person, or $60 per person per day for 3 meals. This includes use of our self-serve tea bar with the meal.